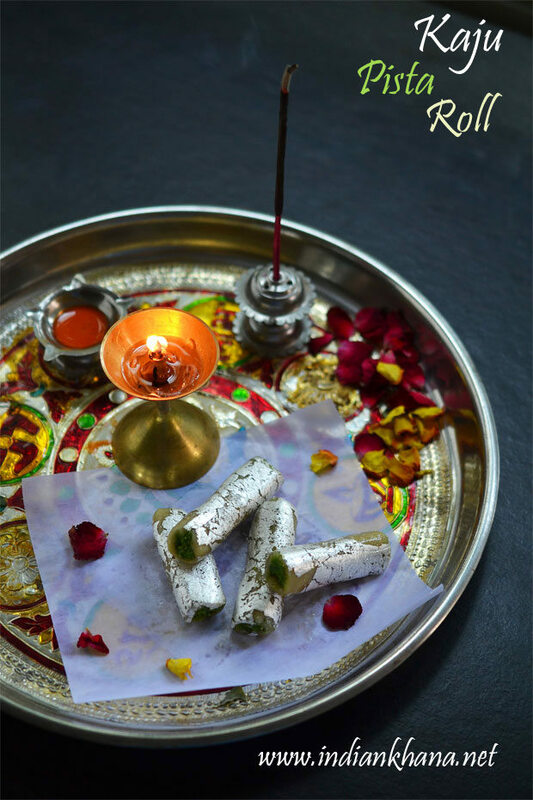 I wanted to post this kaju pista roll for long and this is also very easy to prepare just like how we make kaju katli (yes I am yet to post kaju katli too) and make pista mixture to make our delicious and pretty sweet. 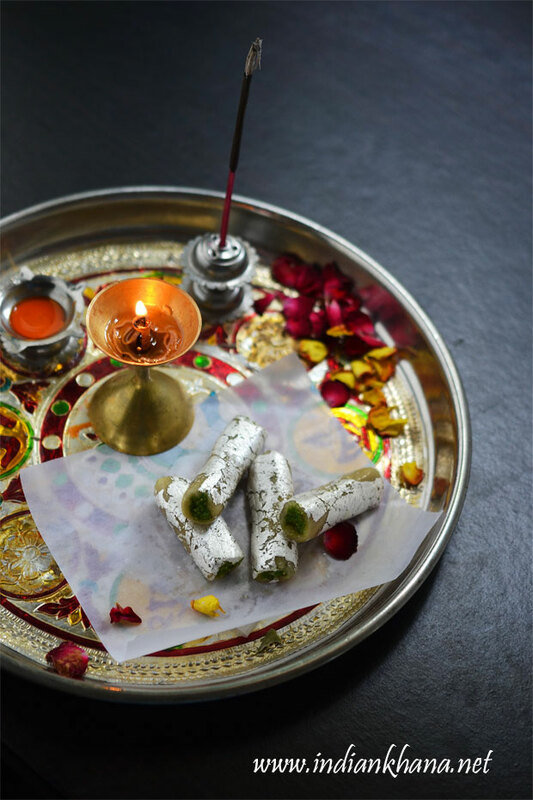 This sweet is also vegan, if you don't use ghee which is not really required too until we need and milk which again not needed, or replace ghee with oil and milk with water, check out vegan diwali sweets and snacks recipes here. Using butter paper or plastic roll to roll cashew mixture and using the same to roll up into log shape too, it's very easy and mess fry. We can also makes this as kaju pista burfi or double layer burfi. Try this easy sweet for diwali, your family and friends will sure like this. 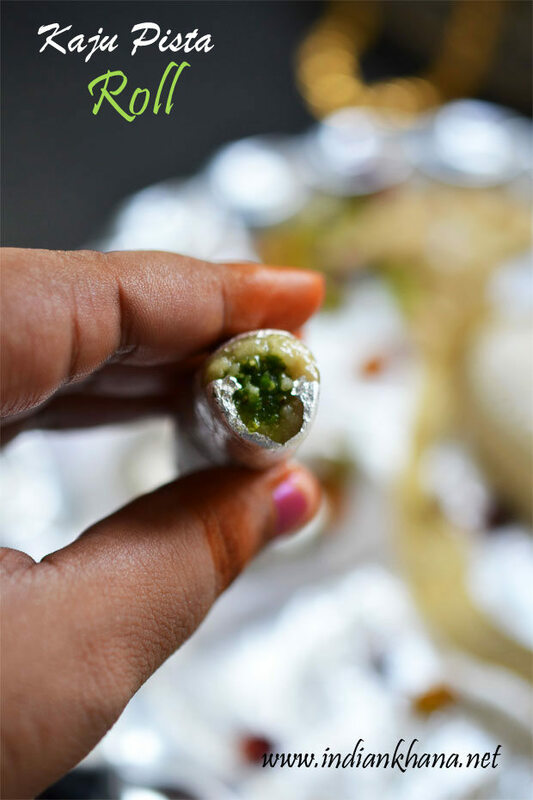 Do share you feedback if you try this yummy kaju pista roll. If you look for some healthy sugar-free, fat-free vegan roll then check this dry fruits and nuts rolls. 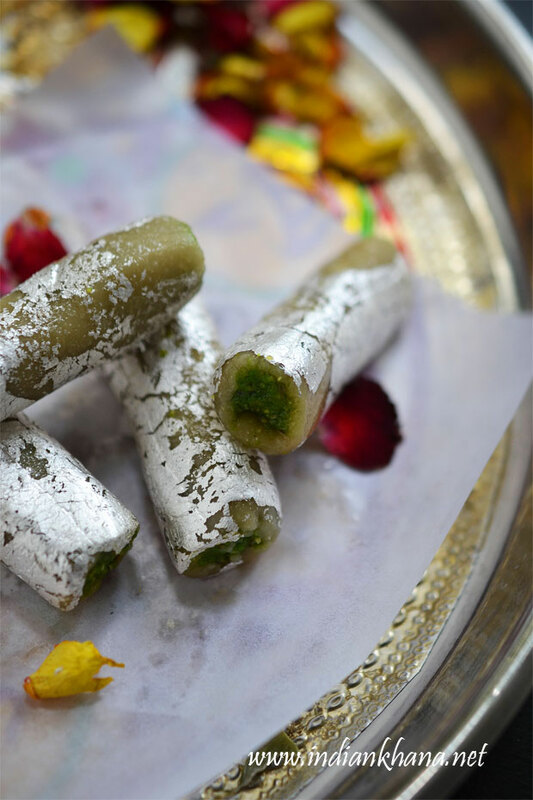 Popular, delicious Kaju Pista Rolls (Cashew and Pistachio Rolls) perfect for diwali. Make sure cashewnuts and pista are in room temperature, grind cashews in dry mixer or coffee blender into powder, keep it slightly coarse, make sure you don't grind it too much so it becomes paste. In a pan or kadai (wok) take water, sugar and bring it to boil. Prepare 1 string consistency sugar syrup, to cehck in a small bowl of water place few drops of sugar syrup it will form in thread and won't get dissolves, you syrup is ready. Add cashew powder and mix well to avoid any lumps in slow flame, keep stirring for 3-4 minutes until it mixture starts to leave side of pans and forms into dough. If you take small amount of mixture and roll it will form into ball, off flame now and keep stirring for a minute, allow the mixture to cool, once it comes to slight warm stage knead it well to make smooth dough. You can add 1/4 tsp or 1/2 tsp of ghee to help with kneading. 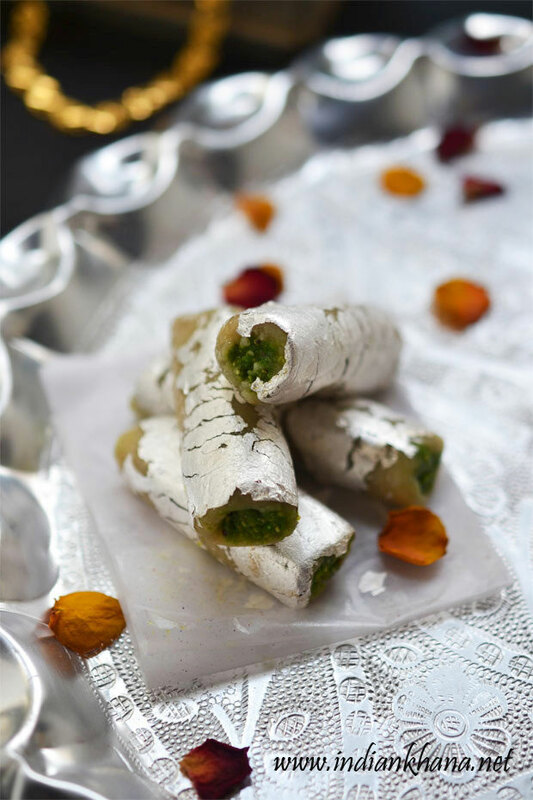 For pista roll, grind pista into powder and in a bowl add powdered pista, sugar powder (use less since we have sugar in cashew mixture too), food color (if using) and mix well for form a dough, sprinkle few drops of to help in binding. Now divide the mixture into 4 portions and roll one portion into thin log or cyliner shape as in below picture, keep the dough covered all times. Divide cashew dough into 4 portion too (keep the dough covered all times), take one portion and roll between plastic sheets or butter paper into rectangle. Now place the pista roll in middle carefully and using the plastic sheet rollup cashew so pista gets stuffed/enclosed in cashew. Roll cashew roll gently to get smooth texture, cut the both the edges and cut roll into 2 inch long cylinder. Repeat same for rest of pista, cashew dough, if using sliver warq, gently press sliver foil/warq on cashew pista rolls (you can also apply sliver warq first and then cut rolls). You can keep the rolls in fridge for 30mins to 1 hour to firm them up. Stay good for a week to 10 days if refrigerated. If the cashew dough dries up, add 1-2 tbsp milk and knead again, but this will reduce the shelf life. You can skip pista and make this as only kaju roll. Sugar syrup consistency is important so do not miss that, if you are not very sure once the syrup becomes sticky add cashew powder. Make sure both nuts are at room temperature before your powder them. Cashewnut mixture will not be smooth, don't worry we will knead it to make smooth. 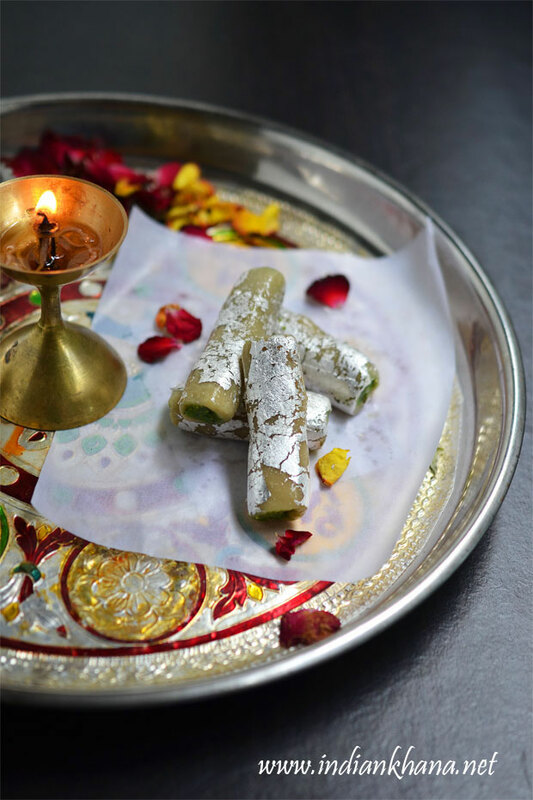 You can also make this cashew pista burfi. 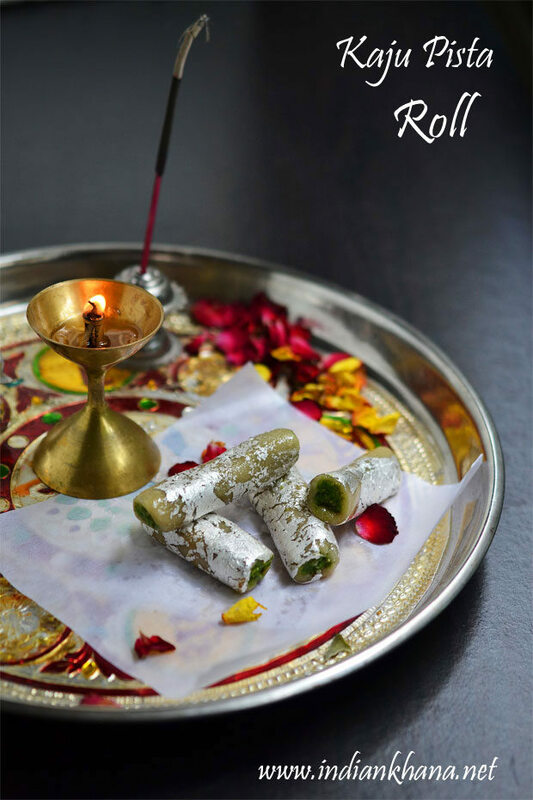 Very festive looking popular kaju pista roll.